This weekend saw the second round of Six Nations matches. Well almost... England edged a win in Italy and Wales saw off a mini fightback from Scotland but the game between France and Wales was postponed due to the weather. 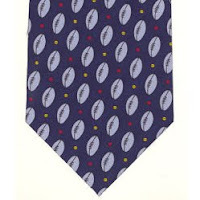 At least that will allow more opportunity for fans to wear one of these Silk Rugby Novelty Ties, available at TiesPlanet.com. Are You Looking to Tie the Knot?